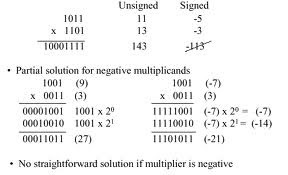 Booth's multiplication algorithm is a multiplication algorithm that multiplies two signed binary numbers in two's complement notation. 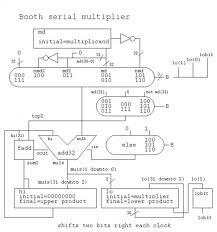 The algorithm was invented by Andrew Donald Booth in 1951 while doing research on crystallography at Birkbeck College in Bloomsbury, London. Booth used desk calculators that were faster at shifting than adding and created the algorithm to increase their speed. Booth's algorithm is of interest in the study of computer architecture. We also can use The Baugh-Wooley algorithm to multiply two unsigned numbers together.